Perseverance is defined as persistence in doing something despite difficulty or delay in achieving success. It is, without doubt, the biggest skill-set you must learn as a manager. Along with perseverance, patience is defined as the capacity to accept or tolerate delay, problems, or suffering without becoming annoyed or anxious. This is another skill-set that is very important to have. Sometimes we lose sight of these things, and it’s okay; we are human. However, let’s dig deeper into why these two are so important. When we are hired, it is to manage tasks, metrics, team members, patients and whatever else may fall into our laps. If we allow the tasks at hand to overcome us, we are not able to manage properly. I have struggled with this many times in my career, but I have also learned some very valuable lessons about perseverance and patience for dental managers. This was a very important skill that I needed to learn. It is hard, especially when you genuinely care about people. I have a passion for people, and I can easily put myself in their position. When a team member has an issue, and they come to me, I listen, and I used to put myself down in their hole with them. I thought I was being compassionate and understanding. Instead, I would help them out of their hole, but then I was down in that hole alone. You can listen and be compassionate, but stay on top! Help them find a way out, but give them the tools they need to get there by themselves. This creates the skills they must learn, so they can keep themselves from digging further holes. Thank you to our wonderful consultants Next Level Practice, who helped me learn this very valuable lesson. You see, even after being in the dental field for over 30 years, and presently at my job for over 11 years, I can still learn new lessons about how to be a dental manager! When I was starting in dentistry as a dental assistant, I often heard, “The patient is always right.” This is not the case. Our patients are humans too. They sometimes do not hear instructions correctly, or they misunderstand due to the anxiety of being in the dental chair. It is important for all team members to be on the same page. Therefore, a morning huddle is so very important. We meet every morning and go over the schedule for the day. We talk about every patient so that we start the day identifying each one and their specific needs. This way, if a patient doesn’t understand something, we know we are all giving that patient the same care and advice, no matter which team member is communicating with them. You must be cohesive, so there is no room for error. Managing takes a lot of patience. We are support beams. We hold up the structure of the building after a firm foundation is set. If your foundation is not sturdy, you need to be persistent in achieving this. If not, the support beams will carry too much load, and they will start to bend. This was our case a few years ago. Before hiring a consultant to help us create a firm foundation, I was bending and about ready to break. I hope you are not in the same place as you read this article. However, if it strikes a chord, perhaps you should consider outside help. It is okay to need help. You can’t do it alone. Repeat that last sentence. Go ahead, repeat it again. This is also where AADOM comes in. There is a plethora of support online including dental management articles and dental management videos! Chances are, once you are brave enough to ask for help, there will be hundreds of like-minded people—your tribe—who have been where you are. Everyone is so eager to help, and nobody judges you for needing a little assistance. I must be honest with you; this skill is a constant learning process. I am not perfect, and neither are you! However, our team members, our doctors, and our patients… they are all looking to us for answers, solutions, and understanding. There are moments when you are struggling, and perhaps you don’t feel like you can solve one more problem. This is when you need to identify where a lack of balance may exist in your work. When we cannot rise above the situation, holding ourselves accountable for the actions we take or the words we speak, something is not in balance. It is our position to be the sound mind and logical thinker. Sometimes you won’t have the correct answer, and it is ok to take time to work it out. Perseverance is needed. Take your time. The right solution is not always the fastest solution. You need to give yourself permission to walk away and find a quiet place to think. I had to walk away from a heated discussion just a week ago. It happens! We are human! I usually walk into the heated discussion and calm it down. This time, I was allowing the situation to get to me. I did not rise above. I finally had to walk away and take some time to figure out a solution. It is ok to need your space, especially when you are dealing with a lot. Give yourself the time so that you can be the voice of reason. Please use your resources, ask for help, seek advice if you are feeling overwhelmed. You are my tribe; we are like-minded people. You are not alone, and you’ve got this. You were hired because you seek to solve problems. Sometimes it’s overwhelming, but your tribe is here, waiting for you to ask. Don’t give up; get online, get on the phone, whatever you need to do… just get yourself in balance. Your team depends on you. 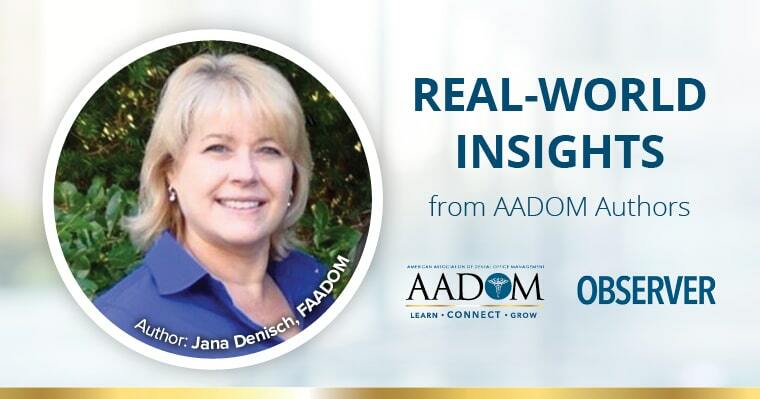 Jana Denisch, FAADOM is the Business Manager at Keith A. Boenning, DDS, LLC. Dr. Boenning is a Prosthodontist in the Baltimore, Maryland area. 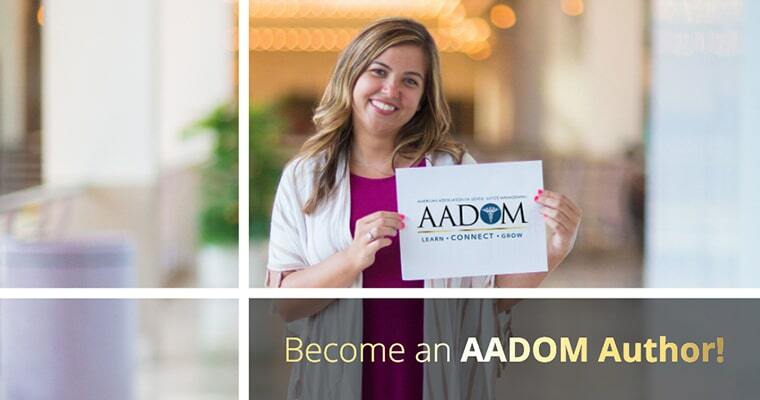 She has been a member of AADOM since 2009, FAADOM since 2012 and was awarded the Office Manager of Distinction twice. 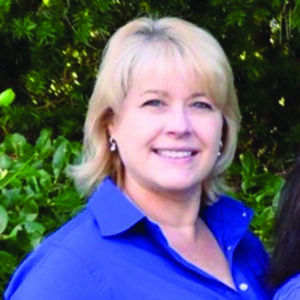 She has worked in the field of dentistry for over 30 years.